Convert movies, videos and music for all generations and versions of PSP or PS3. Problems transferring your favorite movie/video to your PSP, PS3 or PS3 Slim because of compatibility issues? With the ImTOO PSP Video Converter, this is now a thing of the past! This all-in-one PSP converter can convert nearly all video formats (incl. AVI, MPEG, WMV, MP4, DivX, MOV, AVCHD, MKV, FLV, 3GP, VOB, GIF, RM, ASF) to PSP MP4 or H.264/AVC format in different resolutions (480p, 720p, 1080p), and convert audio formats (WMA, WAV, M4A, AAC, AC3, OGG, CUE, APE, CDA) to PSP MP3 format. In addition, the PSP movie converter allows you to convert multiple files simultaneously; split files and other powerful features. 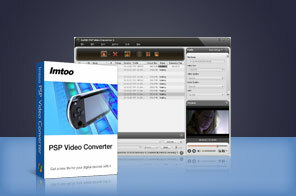 Download the ImTOO PSP Video Converter for FREE now! Convert various video formats to PSP video formats (such as AVI to PSP, MKV to PSP, WMV to PSP, VOB to PSP). Convert audio formats (such as WMA, WAV, M4A, AAC, AC3, OGG, CUE) to PSP music (MP3, M4A, WAV, WMA). Convert various video formats (such as AVI, MPEG, WMV, MP4, DivX, MOV, H.264/AVC, MKV, 3GP) to PS3 MPEG-4 video format. Directly transfer files to your PSP after conversion. Adjustable aspect ratio (4:3 and 16:9), CD decoding, power management, resizable player are available. Supports multi-core CPU – convert files at the highest speed. Multi-file PSP movie converter – convert multiple files at once with support for multithreading and batch conversion. Split a large file into several smaller files so you can fit it onto your PSP; customization of split size or duration possible. Directly convert a segment from the original file by specifying its start time and duration. Convert a file into multiple different formats while preserving original file content. Convert a file to the required size with ImTOO PSP Video Converter's built-in Bitrate Calculator. Adjustable parameters including bit rate, frame rate, sample rate, codec, audio channel and quality. Preview source file before converting; capture images while previewing and save them as JPG, PNG, GIF, or BMP format. Ability to auto shut down, hibernate, stand by your PC or exit the application after completing a task. Tutorial : How to put videos on PSP with ImTOO PSP Converter? How to transfer/convert movie to PSP video MP4, put video to PSP with PSP converter?